I realised that I hadn't done a Mumbai restaurant post in a while. Pity that it turned out like this when I finally did one again. The story of a breakfast which spoilt our day. What's the point of knowledge if you don't use it? I read Simon Majumdar's recent post on a bad meal . Over there he wrote, "When you eat out as much as we do, your first instincts about a restaurant usually turn out to be the correct ones". I didn't have a good feeling after my first visit to the new Theobroma at Bandra. And then I went back the next day. I should have listened to my first instincts. I placed my order. Ten minutes of increasingly less gentle prodding on my part got me my patty. I touched it to see if it was heated right. It didn't singe my fingers. Felt good. I took my first bite. Life suddenly became a lot less beautiful as I encountered my first bite of cold, bland, tasteless chunky chicken. I finished the remaining three bites and left. But not before I scanned the menu and saw the promises that it held including Parsi favourites such as Akuri and Kejriwal. So I went back with K on Sunday allegedly for a V Day breakfast. The memory of the tasteless patty unfortunately tucked away deep into the distant space. We reached before the deliveries for the day had started. There were a few brownies from the previous day and the a la carte menu. We started by sharing a chocochip brownie to go with our coffees. The brownie, though not fresh, tasted very good. Quite tiny to share between two but a good idea if you want to make a token effort of keeping the kilos away. I had a black coffee with milk on the side. The milk had milk fat in it! What we call 'shor' in Bengali and 'malai' in Hindi. The stuff we used to spit out from our milk as kids. I got them to change my coffee. Then came the breakfast bummers. Let me talk about the Kejriwal first. Kejriwal is one of our favourite dishes in the Royal Bombay Yacht Club. It is a simple dish. Slice of bread. Fried egg. Slice of cheese. Lot of chopped green chillies. Named apparently after a Yacht Club patron. This is how it looks. And this is how it doesn't look. This is Theobroma's gruesome version of Kejriwal. Spot the differences. No green chillies. Half a burger bread instead of crisp toast. And cheap, salty, grated cheese. The Nightmare on Linking Street continued. 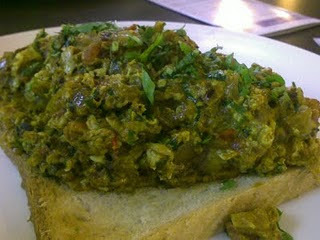 We ordered Akuri, the spicy Irani/ Parsi scrambled egg. My mom in law and her maid make it very well. As do the venerable ladies of Seva Sadan. This is how it looks at Seva Sadan. And this is how it does not look. This is Theobroma's version of Akuri. The redness is not from the blood of dashed hopes. The Akuri was drenched in puree/ ketchup. Was excruciatingly sour. Even a 'gin soaked boy' couldn't have stomached this tomato soaked Akuri. I forgot my middle class valuesand left most of the akoori (Rs 180) unfinished. We left Theobroma with a bitter taste. My advise to you too would be to have the brownies and stop at that. And if you want to spend Rs 500 plus (10 USD) on breakfast for two at Bandra then you are better off going to the Bagel Shop or CBTL. That's gruesome murder of Parsi cuisine right there! Which is surprising b/c Theobroma is owned & run by a Parsi mother-daughter duo. Their brownies are good & I used to really like their Chicken Pesto sandwich at their Colaba outlet. Until they made the sandwich smaller & jacked up the price. That's where most restaurants start alienating their customers. 500 rupees for breakfast! That's just plain "linking road" robbery! OMG! I have eyeing this outlet ever since it opened in our neighbourhood of Bandra - thanks for saving me Kalyan! K: And they ask me why I don't post and Parsi recipes here! Oops, your expression kinda says it all!! I love the Theobroma in Colaba. They shouldn't have branched out! Great to meet another foodie from Mumbai. Rhea, Bong mom ...yes I was very upset. Totally agree with your take on Theobroma Bandra...and with Simran when she says they shouldn't have branched out. Went there recently...had a terrible experience! Was forewarned about not trying any food from there, thanks to your post. But hadn't really bargained for the dessert being bad as well...we'd ordered a lemon mountain cake which tasted more of egg than lemon essence..so much so, that I left it almost entirely uneaten...Left a bad taste in the mouth, literally and figuratively. The brownies were good as usual, to be fair. First, I’d like to say that I really enjoy your writing. I think the problem with Theo Brandra is that the quality is nowhere near as good as it south store. All the times we have been the service has been so poor and timely. I waited 15 for a black coffee and another 40 for my breakfast! My partner decide to do some investigating why it was so bad in comparison to its south store and it turns out that the staff have next to no experience in cooking or the food the Theo offers! The manager he spoke to (a number of times because our orders came back wrong a few times) had only been employed for a week. What made it more apparent that experience was lacking is when we knew the menu better then the staff! Thanks so much for writing in. The fact that you took so much pains to find out more about T, and write it shows, the loyalty the name evokes. It's a pity they are messing it up. Yes, the snacks and the lemon tart were awful@ Theobroma. But but but...i know you probably have eaten great cheesecake elsewhere but their new york blueberry (i think) cheesecake was good. really good. but then, that makes it just a one-product shop. Thanks for the update S. Actually 'two product' shop as the brownies are really good. Or so they were. Thank you for your comments on Theobroma of 16th February 2010. No, I am not being sarcastic and I am really thankful that you have taken the trouble to post your thoughts and experience even if they were not complimentary. It is only with constructive criticism that we can realize where we are going wrong and that gives us an opportunity to improve the quality of our food and service. Even though we are troubled and disturbed when a single customer is not happy and satisfied with our eatery we really appreciate that you have brought your experience to our notice. Having said that I would like to clarify a few points mentioned in your posting. So that you have a better understanding of the functioning of Theobroma. 1) You mentioned that your chicken Pasty was bland and tasteless. Our chicken is cooked in mild herbs and spices and covered with white sauce. They are meant to be mild and are for those who want a continental type of snack. In case you wanted something more Indian to the taste, we have also on offer spicy chicken pasty which has a lot of spices and masala coupled with sautéed onions which give a more Indian taste to this popular snack. If you want a more exotic taste then I suggest you try this version on your next visit. 2) Re Kejriwal: You have described the normal Kejriwal (along with the photograph). Which is commonly available at many clubs and cafés. However I would like to add that one of the main hallmarks of Theobroma is that we do not make any of our items in the traditional way. We go through great pain and a lot of experimenting in order to improvise and improve the goods that we offer. We try to be different and unique and offer dishes which we feel are an improvement over what is offered elsewhere. Out customers are usually happy with this arrangement and that is why we welcome over a 1000 clients every day at each of our outlets. However if even one of our clients is dissatisfied, we try out best to rectify any mistake we may have made and we ensure that it is not repeated. Our kejriwal consists of homemade burger buns which have been lightly toasted and topped within a mixture of grated cheese, spring onions, spices, egg white and finely chopped chillies (that is why we do not serve thick chopped chillies on the side). After grilling the toppings we place on top, fresh fried round eggs sprinkled with salt and coarse pepper (that is why we use a bun rather than standard white bread slices as they fit perfectly on the warm buns). You have also mentioned that we use cheap salty cheese. As far as salt is concerned I completely agree with you that all Indian Cheese’s (and lot of imported ones) use far too much salt in their product. Unfortunately I have no control over the amount of salt in the cheese and we try to use the best possible cheddar cheese available locally. Cheese is by no means cheap. In spite of India been the largest milk producer in the world it has very poor infrastructure and the cold chain supply is pathetic. As a result cheese is one of the most expensive item we use and I am afraid it will remain so. If you know of any reliable cheese supplier who sells cheese cheaply please let me know. I am all ears for this information. 3) Re Akuri: Again, we do not make it the traditional way in which your mother-in-law or her maid or the ladies of Seva Sadan make it. I am not deriding their product which I am sure is very tasty (and I hope that one day you will offer me a version of your mother-in-laws Akuri) but explaining that we make it differently. I would also like to clarify that we do not use a drop of ketchup in our Akuri. We make a tomato paste (using fresh tomatoes) with ginger, garlic, raw mango, lime and a load of other spices and herbs and topped with coriander. We serve it with warm hash browns and freshly toasted breads. Most of our clients enjoy this dish and keep coming back for more. The sourness you experienced maybe due to the raw mangoes and lime that we add to the Akuri. Next time ask your steward to tone down the spices and tomato paste and I am sure you will enjoy it a lot more. We are truly sorry that your meal at theobroma was not upto your expectations and i sincerely hope that you will give us an opportunity to serve you better next time. Please let me know (9820009498) when you are planning to come to Theo and i will personally ensure that you have a good and satisfactory experience. Once again I thank you for the interest taken and letting us know where we are going wrong. Food tastes are individual specific. I definitely was disappointed with what I faced at the Bandra outlet and felt that I did not get my money's worth. I really appreciate the fact that you made it a point to address this and have offered solutions which could have helped. This is what I feel about what you have written. The cheese in the Kejriwal was salty and I have had less salty versions in restaurants. Including at the Yacht Club. I do hope that we meet someday because I do admire what you have done and I do love meeting people who know and love food. To the passionate proprietress of Theobrama... Madam... your food is a delight, cakes gorgeous, mousses, dips,the adult hot choc to die for. But Madam please i implore thee... do something with ur staff... they have ruined many a peaceful sunday of mine with absoultely terrible service. Today for eg I dropped in at around 12 pm, waited patiently in the queue then placed my order to be parcelled and then set at a table ordered a hot chocolate and asked for a sandwich on brown bread to be parcelled along with all the items id ordered from the counter. I repeated myself to the waiter at least 3 times to ensure he understood. He still attempted to place a knife and fork and plate on the table which is when i repeated my request to parcel ALL the food and bring the bill. 20 minutes later I reminded him again he said you had a sandwich and hot chocolate right? I again reminded him that I had ordered food to be parcelled so he went to the counter and returned with a confused expression. At that point I asked for the manager one mr swapnil, who wouldnt listen and seemed to believe that if he apologiesd everything would be ok. Your counter staff were all grinning least bothered. The guy who took my order had apparantly forgotten about it completely it took a further 3 attempts to get my things parcelled. When I got home exasperated, i discovered that my sandwich was in fact made with white rather than brown bread!!!! The last occasion involved me ordering an adult hot chocolate and finding it without alcohol being forced to return it. Please do take this as a sincere attempt to ensure maximum pleasure at your establishment. I dont think any other eatery in mumbai comes close to matching you guys taste wise.